Phones are down at MHS. Email Mrs. Cummings at cumbr@sages.us or Mrs. Jarvis at jaran@sages.us to report MHS student absences or to get in contact with the office. Looking forward to a great FFA week! No school on Monday, February 18 - President’s Day. Enjoy the three day weekend! (2/2) Freshman BB game at St. T 6:00 p.m. Sage Van - 4:30 p.m. - HS girls V/JV BB game & SR night 5:30 & 7:00 p.m. SR Night will be after the JV game. If Olympia is unable to travel, girls will practice and SR night will be on Friday, Feb 1st - HS Musical practice 6:30-9 p.m.
(1/2)The following activities will be held on Thursday, January 31st. - HS cheerleading practice at MMS 3:00 - 5:00 p.m. - HS varsity boys basketball practice 3:00 - 5:00 p.m. - HS wrestling practice 3:30 - 5:00 p.m. The Clinton Community YMCA is looking for qualified applicants to staff the Monticello Y-Zone Program (Before & After School Child Care) at the Lincoln Elementary School. The Monticello Y-Zone program runs before school from 6:30am-8am and after school from 3:15pm-6pm. Ready to welcome back teachers today and excited to have students back in the building tomorrow! 2018 Monticello Athletic Booster’s Holiday Hoopla starts today! Come out and support MHS Band and MHS Choir tonight as they perform in the Winter Concert in Miller Gymnasium at 7:00 pm. Madrigals will be performing Friday, December 7 and Saturday, December 8 at 6:30 in MHS Auditorium. The MHS Blood Drive is today! All signed teacher slips and parents permission forms need to be turned in asap. Thanks to all who signed up to save lives! See Lily Brown or Cansas Buckalew with questions. MHS will dismiss at 2:10 tomorrow for Thanksgiving break. Sages girls JV and Varsity basketball game tonight against Meridian is CANCELLED due to Meridian out of school. At this time, no make up date has been set. Go Sages! MHS Career Day is tomorrow! We are excited to offer a variety of speakers for our students! Congrats to girls XC team for placing 13th overall as a team at state! Congrats to boys XC team for placing 3rd at state! Garrett Dixon placed 2nd as an individual! Congrats to the Sages Football Team for beating Anna-Jonesboro and advancing to the IHSA 3A quarterfinals! Join us in MHS cafeteria at 7:50 a.m. on Friday, November 2nd as we send off our boys and girls XC teams! They will be headed to Peoria to compete in the IHSA State Finals at Detweiler Park on Saturday! The girls race begins at 9 a.m. and the boys race is at 10 a.m.
MHS is experiencing technical issues with the internet, and it is currently down. Our technology department is currently working to remedy the issue. In the meantime, if you need to contact MHS, please call the office at 217-762-8511 x1210. Sage fans traveling to SJO High School tonight for the football game may want to consider an alternative route. I-74 is one lane from Urbana to St. Joseph. I-74 and US 150 can become congested between 4-7 pm. MHS welcomes the WCIA Morning Show bright and early Friday morning! Tune in to Channel 3 at 6 am for a chance to catch the Sages! Coverage will feature Coach Welter, football players, cheerleaders, band, and Sammy Sage! Reminder that the First Quarter is coming to a close on Friday, October 19! Time flies when you are having fun! Finish Strong! Thank you seniors for all your hard work and dedication to our volleyball program! 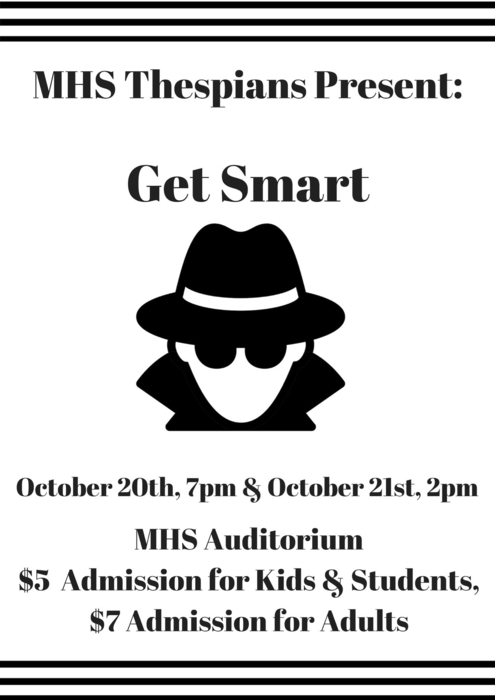 Come out to MHS October 20 and October 21 to support our students as the present Get Smart! They have been working hard! MHS Choral Concert begins at 7:00 pm tonight in the Auditorium! Come out and support our students! Exciting day to be a Sage! Molly Stringer tees off at 10 am at the state golf tournament, boys’ soccer plays in the IHSA regional championship against Cornerstone Christian Academy at 4:30 pm, Senior night against Prairie Central at 7 pm for football, cheerleading, and band! Football Playoff Apparel is OFFICIALLY ON SALE! Orders placed and paid in full to the high school office by noon on Wed, October 17th will receive the order before the first round on Sat, October 27th. Order forms can be picked up outside the HS office. Sages travel to Pontiac in a battle of IPC 6-0 teams. It should be a great match-up tonight, and the winner will be in the driver's seat for the conference championship! Big day for MHS Athletics: IHSA Boys’ golf regionals at Willow Pond Golf Course, Sages XC hosts the Illinois Prairie Conference meet at Lodge Park beginning at 4:30 pm,and Sages Volleyball hosts Pink Out vs Rantoul in Miller Gym with the freshman starting at 5 pm. Looking forward to sending our senior golfers and senior cross country runners off in their last home events this season! Great group of kids! Come catch Sages golf at Monticello Golf Club at 4 pm and then head over to Lodge Park for XC at 4:30! Check out @SangamonValleyCEO Facebook page for all of the latest information about our new CEO program launching in the fall of 2019! The Student Advisory Group met for the first time today during homeroom. SAG is a collaborative opportunity for students to meet with administration, discuss what MHS does well, and how we can continue to improve the student experience! Looking forward to another great year! Thank you to Monticello Music Boosters, parents, and all volunteers that made the Sage City Invitational possible. Another outstanding performance by @SagesBand! The 17th annual Sage City Invitational steps off at noon! Come out to MHS to see some great performances! Academic Assembly is set to begin at 8:15 in Miller Gym. We will be honoring 231 students who had a 3.25 GPA or better last year. Kyle Dooley, a 2008 MHS grad and Athletic Hall of Fame inductee, is the keynote speaker. Busy Thursday at MHS! Mr. Clapp and Mr. Sheehan will be grilling hamburgers and hotdogs for lunch, Capture the Flag: Star Wars addition during Homeroom, and the dress up theme for the day is Star Wars! Don't forget the Homecoming Bonfire is tonight at 7-9 pm! Home Athletic Events for Homecoming Week 2018! Tuesday, September 11th - Cross Country at Lodge Park 4:30 p.m. - Soccer vs. SJO 4:30 p.m. Friday, September 14th - Varsity Football vs. Rantoul 7:00 p.m.
Financial Aid night at MHS will begin at 6:30 pm tonight in the auditorium. A representative from the Parkland College Financial Aid Office will present information on financial aid and FAFSA completion. Randy Grimes and Tim Ryan had powerful messages today at MHS. If anyone would like to hear their messages stop by the Livingston Center tonight at 6:30 in Monticello. Sages Football at St. Thomas More will be streamed live on the NFHS network tonight and audio will be available over the air at WEZC 95.9fm. Visit https://www.nfhsnetwork.com/ to subscribe and watch the Sages! Monthly, seasonal or yearly passes are available for purchase. Fall play cast is set! Get Smart rehearsals start September 6th! Great presentation at Monticello Rotary today about the new Sangamon Valley CEO program that will debut in fall of 2019! I am looking forward to our students partnering with Argenta-Oreana, Bement, Cerro Gordo, and Deland-Weldon high school students and our local businesses! Due to expected temperatures, MHS will dismiss at 2:10 on Wednesday, September 5. MHS will be dismissing at 2:10 tomorrow due to heat. Come out and support the Sages tonight as they take on Illinois Valley Central High School! Grab a pork chop sandwich, chips, and a bottle of water for $5 provided by Monticello Music Boosters while you are there! Come out and support our Sages Football Team tonight as we take on Olympia High School! MHS Marching Sages will perform for the first time this year, and FFA will be selling pork chop sandwiches! It's a great day to be a Sage! I am looking forward to welcoming students back on August 22!